I’ll be the first to admit I have a massive sweet tooth and I am obsessed with chocolate. Smoothie bowls are a great way for me to satisfy this craving. If made properly, it is almost like eating ice cream with a bunch of fun toppings! This recipe is actually my all-time favorite. I like it so much that I have to make it sparingly otherwise it will be the only thing I’d eat. So I’m going to share this super simple recipe and hopefully someone else can share my addiction and understand my struggle. Place the cherries, banana, and avocado in the blender. The avocado makes the end result more creamy but isn’t necessary. Just make sure the avocado isn’t super ripe. My blender blades are dull so I have to add a little bit of water. However, if you can blend the cherries and the banana without water, go ahead and do so. If you have the same problem I have, add only a little bit of water at a time. I would say start with around a tablespoon and add more from there. The less water, the better. You could also sub in plant-based milk instead of water if you’d like. However, I don’t notice much of a taste difference. When it’s mostly blended (doesn’t have to be completely smooth) add in the cacao and protein powder. You could also add hemp seeds or chia seeds here if you would like. This prevents the powders and seeds from sticking to the sides or bottom. Now blend until it’s a smooth consistency. It should be really thick. Dump into a bowl and serve! I have also listed some topping suggestions. You can use some of the ones listed, or make up your own! This is your masterpiece. Don’t forget to take an instagram-worthy photo and tag me in it! I’ve received a lot of questions lately about Whole 30 so I wanted to share my experience and advice in a post. A lot of information can be found on their website (whole30.com) but I’ll summarize it really quickly. The idea behind Whole 30 is that you only eat whole foods for 30 days in order to detox your body from all the garbage we eat on a regular basis. At the end of the 30 days you are supposed to slowly reintroduce the foods you cut out to find out what foods you are intolerant to or that is making you feel gross. What they mean by whole foods is only high quality meat, fruits, and veggies. This means no legumes, grains, sugar, alcohol, or dairy. They have more detail on their website but this is the general gist of the rules. They also have other rules like no stepping on the scale during this process. I did not follow this rule but I did follow the food regimine. The reason behind me doing this was my health and fitness buddy, Michelle, wanted me to do it with her. Since I was in the process of losing weight, I thought why not. Now I have someone to hold me accountable for eating right and I have a set of rules. Plus I liked the idea of reintroducing food at the end. So I thought the worst that could happen was that I lose weight because there is no way I wouldn’t with how you have to eat on this diet. Not a bad worst case scenario. So on June 1st, we started Whole 30 together. The first couple days were not too bad. The hardest part was planning ahead. I didn’t really know how to eat out in the beginning. I was also taking summer classes and working all at the same time. Trying to figure out what to bring and how much was difficult so I wouldn’t be stranded and hungry. The only other symptoms I had in the beginning were headaches due to the sugar withdrawal. I suspect for people eating really unhealthy to going to this diet would experience more detox symptoms but this was not the case for me. About a week or so in I had gotten the hang of being able to eat out as well as understanding how to read nutrition labels. Out of everything that came from me doing Whole 30, this skill was by far the most valuable. My family especially can vouch for me. Whenever I go to the grocery store, it is now habit to read the ingredients in everything I buy. I feel like I now have the power to know exactly what I am putting into my body. However, around this time I started experiencing some negative symptoms. I would feel really light headed and nauseous. I felt like I couldn’t drink enough water. I would feel so sick I would just have to lay down. Anytime this happened, it would last for hours and sometimes until I went to bed. At the time, I didn’t know what was wrong. I now know that I wasn’t getting enough sugar and I was experiencing symptoms of low blood sugar. When I say this, I don’t mean processed sugar. I mean natural sugars like from fruit. You by no means need to eat processed sugar to prevent this from happening. I either just wasn’t eating enough calories or not eating enough fruit or a combo of both. Regardless, I kept getting sick and I didn’t know how to get better. I even went to concert with one of my friends and fainted. I tried going to the doctor. They couldn’t tell me either. But after reflection and logging these instances for months, I finally figured out it was just low blood sugar. Nearing the end of the month, I had gotten used to eating that way. I was just bored of it and ready for the month to be over. I missed having the freedom of having a dessert or being able to go out to eat with friends. I felt as if I was waiting out a prison sentence. I just wanted it to be over. On July 1st I was super excited. If you know me at all, you know sushi is my favorite food. On Whole 30 you can’t eat rice so I was missing my favorite meal. So some friends and I went out to a sushi restaurant to celebrate. I cannot tell you the kind of stomach pain I was in. When I got home, I had to go lay down for about an hour. In the days that followed, I went back to exactly how I was eating before Whole 30. I wasn’t eating bad before, but I definitely wasn’t eating great. The only thing that changed was that I felt free to eat more junk so I did. Even though I still continued to lose weight, I developed the habit of eating junk food more frequently. I was making better choices in the junk food I did decide to eat though because I understood how to read nutrition labels. During that month, I lost ~12 lbs. This was consistent with the rate at which I was losing weight before. So I didn’t necessarily lose anymore weight than I would have lost had I continued what I was doing. Other than learning how to read nutrition labels, the only other significant benefit was that I learned that I was lactose intolerant. The photo on the left was taken June 1st and the photo on the right was taken July 1st. Based on my experience, I would not recommend doing Whole 30 unless you are extremely committed and want to learn what foods you are intolerant to. It is so easy to mess up the reintroduction phase after the 30 days (I did) because by the end you may be over the whole thing. As a weight loss tool, this is not the one. It is not a maintainable diet plan and therefore is the reason why I wouldn’t suggest doing it. It is so easy to relapse and go back to eating junk food. My friend Michelle relapsed pretty hard after the 30 days. On top of that, the detoxification process can be really hard on your body as well. If you are looking to eat better, I’d recommend gradual, maintainable changes rather than jumping in to as extreme of a diet as this one. If you would have told me a year and a half ago that I was able to run an entire 5k race without stopping, I would have laughed. If you would have told me that I didn’t come in last place, I would laugh even harder. If you would have told me that I valued running that race enough to pay $20 to enter, I’d be on the floor unable to breathe I’d be laughing so hard. I’ve never been a runner. I’ve always been the slowest kid in my class. I could barely pass the mile test they made us run in middle school. I just did not have the stamina or the willpower to be a runner. So, running not one but two five kilometer races this year was a huge accomplishment for me. Here's a photo of me and my best friend before our first 5k. I didn’t start out my health and fitness journey with the goal of running a 5k in mind. I actually didn’t think about running at all. I just wanted to be able to WALK without feeling winded. However, once I was able to do that I began to think about a lot of things that I thought was unthinkable for me. I started going to our campus gym. I wanted to be able to run half a mile without stopping. I was able to accomplish that fairly quickly. Then my goal was a mile. Running was fun for me because it was so easy to measure progress. I really started enjoying it. I even downloaded an app called Map My Run to keep track of my time and distance better. I wanted to get faster and faster and be able to run farther and farther. It almost became a game for me. At one point I was talking to a coworker about my newfound love for running and turns out she was the perfect person to talk to! She had run a marathon and several half marathons in her life. She suggested that I should sign up for a race since I enjoyed it so much. Before, it had never even crossed my mind that I could be in a race. I didn’t even know how to go about it. After googling for a total of .2 seconds, I was able to find several 5k races close to me in the very near future! I convinced my fitness buddy, Michelle, to run a race with me. We were both super pumped. My sister and I after my second 5k and her first! Leading up to the race, I wouldn’t say that I really changed my “training” regimine which was pretty much just running whatever I felt like running. My goal was that I wanted to be able to run the entire thing. I went to the gym about a week before the race to see if I could run 5 kilometers without stopping. To my shock, it was so easy for me! I felt that it should be much harder. I had never run more than 2 miles before just because I get bored after a while of running. But to my surprise, I had built up enough strength to run that far! The day of the race I got a little nervous. I was worried the path may have too many hills or I might get tired and not be able to reach my goal. But I was determined. I was thankful to have brought Michelle with me or I might have considered backing out. I am happy to report that I was able to run the entire way without stopping and even finished 74th out of about 150 people. I ran another race about a month later with my sister. We didn’t run the whole way because I just wanted us both to have fun and do something together. 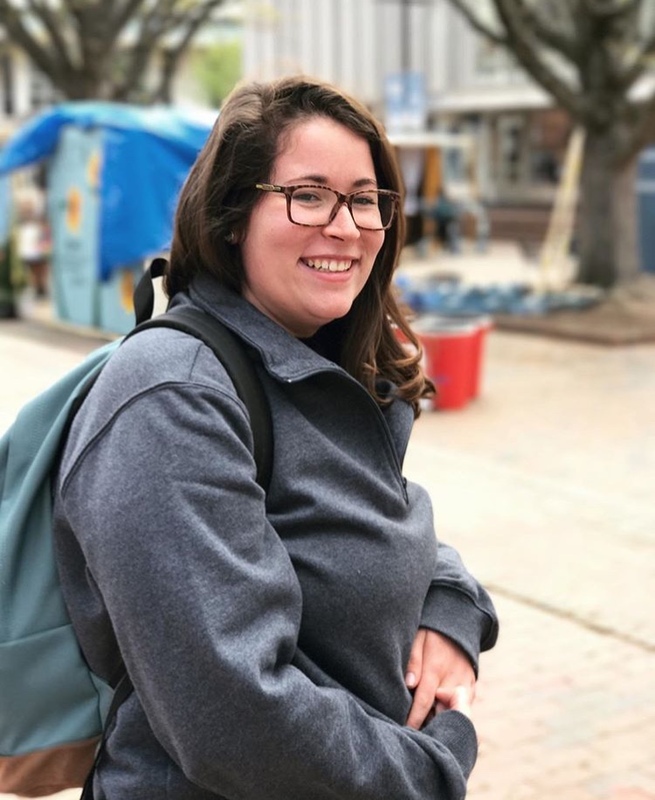 I wanted to share my experience because we all have those things that we kind of want to do but never think we’d be able to. Before I started on this journey, I was the laziest person I knew. So I wanted to prove to you that if the laziest person ever can run a 5 kilometer race, you can accomplish whatever goal may be seemingly impossible to you. It just takes a little hard work and determination and in time you can reach your goal too! Ice cream has always been one of my favorite desserts. So “dieting” without eating ice cream just seemed like a life I did not want to live. Also in my process of getting healthy and losing weight, I learned that I was lactose intolerant. Eating dairy just made my stomach hurt. However, I just thought that was normal until I cut out dairy and realized it wasn’t. So for the past 1-2 years I have been on the hunt for healthy ice cream alternatives. Here are my favorites that I have found thus far! Nine times out of ten, this hits the spot. If you don’t know what nice cream is its just blended frozen bananas. You just freeze really ripe bananas (the more ripe, the more sweet they are) and once they are frozen you just pop them in a blender and it turns into this creamy consistency. This is great on its own. As a chocolate lover, I love to add cacao powder to make it chocolate flavor. I’ve made all sorts of flavors from mint chocolate chip to peanut butter. I just make whatever I’m craving! I have mixed feelings about Halo Top. If you find a flavor you like, great! I find that some of their flavors taste really watery, especially any vanilla-y flavor. For me I liked their caramel macchiato flavor, but to be fair I haven’t tried very many of them. I like that you can eat the whole pint for under 500 calories, but this is not a treat I will have very often. They don’t have great ingredients in their ice cream (lots of added sugars of course). However on occasion when nice cream doesn’t cut it, this is a good one to eat and still remain in a caloric deficit! This has become a recent favorite of mine! While this is a calorically dense food, this ice cream has the creaminess that the other alternatives lack. I will say, I have a history of binge eating. But, a little bit of this ice cream can go a long way! (Not to say I haven’t eaten the whole pint in one sitting) I’ve had all three of their flavors. If you know me, the chocolate one was my favorite, but the mint was a close second. The lemon never stood a chance. This ice cream is hard to find. I have been able to find it at Fresh Market, but you may also be able to order it online somehow. There you have it, my favorite ice cream alternatives! Who says that you can’t eat ice cream and still be healthy? Seriously though, sometimes I will make nice cream for breakfast. It really satisfies my sweet tooth without getting me off track for the day. My friends and family can vouch that I got through a lot of bananas. 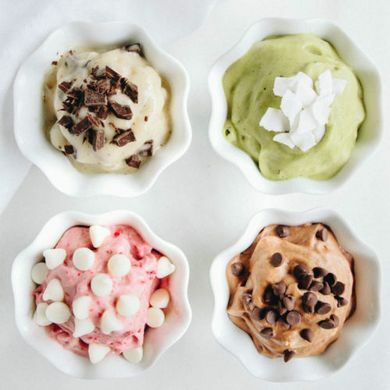 These are not the only ice cream alternatives I will eat but they are the most healthy. I say if you’re really craving some junky food and you know none of these alternatives will satisfy that craving, I say go ahead and have it! Life is all about moderation so having the occasional “bad” treat won’t ruin you. It’s your habits that make up your health. But, these are some options for you when you just want something sweet and ice cream-like and don’t want to feel deprived. When I started my weight loss journey, I didn’t go cold turkey on the junk foods I loved. I felt that wasn’t a sustainable way to eat. I wanted to gradually shift to healthier alternatives. As a newbie to healthy eating, I had very little idea on how to eat healthy while also keeping it interesting and enjoying what I was eating. Hence why I wanted to create this healthy swaps series! In this post, I wanted to dive into pasta alternatives since pastas had been such a large part of my diet. These helped me out a lot in the beginning when I didn’t know what the heck I was doing. 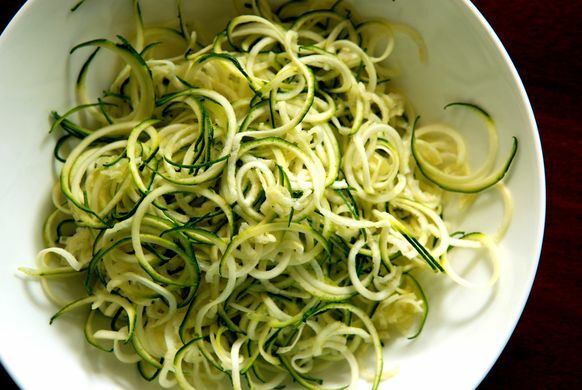 I bought a spiralizer from Target for around $10. I spiralized zucchini and occasionally carrots. My go-to was to mix this with pesto and mushrooms. This was a great way for me to get more veggies in. It also helped me get used to the taste of vegetables. Although zucchini has a very mild flavor if any flavor at all, the fun texture allowed me to eat more veggies. I will say though that if you are really craving pasta, sometimes this doesn’t satisfy that craving. When buying brown rice pasta I try to find ones where the only ingredient is brown rice and sometimes water. Trader Joe’s has good fusilli pasta and Aldi has good penne. This is a great alternative because it is made out of a whole food instead of wheat and other unnecessary ingredients. 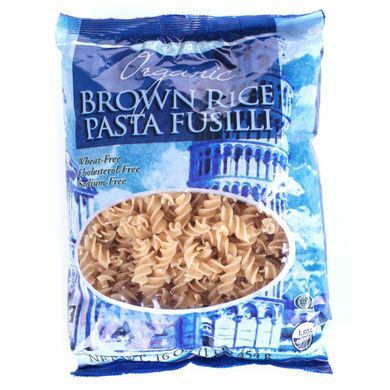 There is little to no taste difference between brown rice pasta and regular pasta so this is a good option for non adventurous eaters. They also have edamame pasta and black bean pastas out there, but I find the brown rice ones to taste the closest to actual pasta. However, these pastas are calorically dense like regular pasta. If you are aiming for weight loss, portion control is key here. This is the holy grail of noodle substitutes. I’m not kidding when I say this will change your life. The whole 1 lb bag is under 20 calories (you heard me right) and they have the same texture of noodles! The ingredients are also great; it’s literally just kelp. You just have to know how to make them. You must mix baking soda and lemon on the noodles until they become soft and then rinse once they are the texture of your liking. So what’s the catch? For one, they can be kind of pricey. These bags never last me long partly because I love noodles and am obsessed and don’t feel bad for eating the whole thing when they are so low calorie. The next issue is where the heck to find them. I’ve only found them so far at whole foods in the produce section in the fridge kind of near the vegan cheeses. However, you can order them on Amazon! You just have to be patient enough to wait at least two days if you have Prime or plan ahead. I have tried many, many pasta alternatives so there are many more I could talk about here. Many of the ones I tried either weren’t good or didn’t have the best ingredients. However, these are my favorite and the ones I find myself continually buying. Next week, I will be talking about my favorite ice cream swaps! Leave me a comment or DM me on instagram if there is something else you would like me to do a healthy swaps for! You’ve probably heard of minimalism before. You know, the people that own almost nothing and live in those tiny houses (they even have a show on HGTV about these houses!). So when I say I’m a minimalist, this is likely the first thing you think of. However, I’m here to tell you this is not the case. I live in a normal size house, have a decent amount of belongings, and enjoy shopping from time to time. “But Emily, isn’t shopping taboo if you are a minimalist?” It actually isn’t and I’m here to explain to you my take on minimalism! My minimalist journey started about 2 years ago when a friend of mine recommended a book to me called “The Life Changing Magic of Tidying Up” by Marie Kondo. She told me it would change my life. I guess it has to if it has life changing in the title. So I bought a copy and read it. It really did change my perspective on my possessions. The overarching point of the book is that you should only own things you love. If you hate it, why do you even have it? The same philosophy can be applied to anything. If you don’t like your friends, why do you hang around them? If you hate your job, why don’t you look for a new one? So on and so forth. The book not only teaches you this philosophy, but it also teaches you how to methodically go through your possessions until you only own things that you love. This may sound ridiculous or impractical but just stop and imagine with me for a moment. You are sitting in your room, house or apartment. The only things you can see are things that bring you joy. You love your bed, your blankets, your desk, YOUR CLOTHES, everything! Everything around you brings you joy and serves a purpose for you. No more digging through your closet filled with a bunch of items you only half like to find the one shirt you do. No more scouring your knife drawer to find the only one that’s actually sharp. No more! Everything you have is everything you need. This idea really appealed to me. So after finishing the book I couldn’t wait to bring this mentality into action. I went through the process described in the book and I’m happy to report I feel amazing. I feel like I can let go of anything in my life that no longer serves me. My friends may look at my closet and say I have no clothes but I love every piece I have. I can wear anything in my closet and feel confident. Not many people can say that. The beauty of this mentality is it’s not about owning less. It’s about truly loving what you own. I’m not afraid to buy more things if I enjoy them and they will serve a purpose for me. For me, minimalism isn’t about numbers and never will be. Not only do I have this mentality about my possessions, but it has spilled over into my life as well. I’ve let go of toxic people in my life, horrible habits, and anything else that caused damage to my wellbeing. You may be asking yourself why the heck am I even talking about this. I thought this was a weightloss blog. The reason I wanted to share this with you is because once I was able to declutter my life, I was able to declutter my mind as well. Ultimately, I believe this is what allowed me to create the headspace to start my health and fitness journey. My old destructive eating habits were not serving me. My body was holding on to a lot of weight it did not need. I was able to get rid of that weight because my destructive health habits no longer served me and I was ready to move forward. You may think I’m crazy and that’s okay! At one point I thought minimalism was crazy too. I do have to say minimalism has helped me in many more ways than one. It has saved me time getting ready in the morning. I no longer have to look for things, I know where all my possessions are (and what all I have). I no longer have to worry about expensive doctor’s visits in my future due to my poor health. I don’t have to waste time on people who don’t care about what’s best for me. My head is no longer cluttered with thoughts about things that don’t serve me. All I’m trying to say is minimalism is not about owning nothing but loving what you have. If you still think that’s crazy, my advice is don’t knock it until you try it! This was my room when I first moved back from college before I had even heard of minimalism. This is my room when I moved home again, after I became a minimalist. I want to start this post with a disclaimer. YOUR BODY IS ALREADY PERFECT THE WAY IT IS. This post is not meant to encourage hateful thoughts about yourself. It’s to help those who want to grow as a person as well as have their exterior reflect their growth! To achieve your dream body you must first realize that you already have it! Counter intuitive right? If you believe that you are imperfect, that you are too fat, too short, too whatever- you will ALWAYS feel that way. Trust me, before I lost weight, I believed I was too fat and I hated myself for it. Right before my weight loss, I KNEW I was perfect. I ultimately just wanted to be stronger and more physically capable of activities I wasn’t before. I wanted to be able to not have to worry when invited out with friends if I was going to be able to keep up. Deep down, I loved going to parks, swimming, riding bikes, and other activities that were physically demanding. I just told myself I didn’t enjoy them because I was afraid of slowing everyone else down. Once I realized I could be the person who does all these things, I became that person! I lost 60 lbs and was able to finally able to keep up with my friends and even surpass them sometimes! So now that you believe you are perfect, and know you can become the person you’ve always dreamed of, here’s where to go next. This first step is so crucial I cannot emphasize it enough. You must find your “Why Power”. What I mean by that is you need to really find out why you want to do this in the first place. “Because I want to look thinner” is not an answer. Dig deeper. Ultimately, what is the root of you wanting to change your body. For me, I wanted to be able to have fun with my friends without the stress of being incredibly out of shape. Maybe that’s your reason too or maybe it’s something different. Maybe you’re doing this because you want to lower your risk of diabetes and heart disease. It could be a number of things or a combination! Whatever it is, it has to be deeper than something about the way you look. The reason this step is so important is because it will carry you throughout your journey. When you feel like quitting, this will be your reason not to. I said this in my first post but here it is again. Mindset Mindset Mindset!! Your thoughts are what control your actions and you control your thoughts. If you think “I can’t do this, I’ll always be this way” I guarantee you always will be. However, you can change those thoughts and tell yourself you can do this, you will be able to run a marathon, swim 100 laps, lift 200 lbs, whatever your goal is. Even if you don’t believe it, you just have to fake it until you do. If you tell yourself enough that you can, soon you will believe it. Same is true about anything. Repeat something enough times to yourself and you will start to believe it! So watch your thoughts carefully and keep telling yourself that you are a strong and healthy person and soon you will be! There are going to be some days when you just don’t want to do this anymore. It happens to all of us. We get unmotivated and just don’t feel like it and that’s okay! What is important is what we do with those days. You could A. Completely give up and say “screw this” and move on with you life, which is an okay choice. Just know nothing will change if you choose option A. Option B would be to give 100% percent of the effort you do have. Some days we only have 30% of energy to care, sometimes 50%, sometimes 100%. What’s important is do the best you can. First, start by revisiting your Why Power (remember I said this would come in handy!). Remembering why you started in the first place can be a huge motivator towards your goals, especially when you have a deep and personal reason. Once you remembered why you started, then do what you can. If you don’t feel like going to the gym (because to be honest, that’s a lot of effort) maybe just try doing 30 sit ups or something fun like who can hold the longest plank challenge with a friend. If you want ice cream really badly, maybe try nice cream (if you don’t know what this is, google it and your life will be changed). In the end if you can’t even bother with a compromise and you can’t stop yourself from eating a whole bag of chips, THAT IS OKAY!!! The biggest and most important thing is not to let that one bad thing ruin all your hard work. It’s okay to “slip up” or eat something bad every once in awhile. Don’t beat yourself up about it. Maybe try and think about why it happened and FORGIVE YOURSELF! Which brings me to my next point. Having a support team is so important. There were several times throughout my journey where I would struggle and having someone just to talk to who could empathize with me went a long way. If you don’t feel like you have someone you can talk to, there are soooo many facebook groups of like-minded people who would love to help you! You just have to reach out and find them. Pinterest also helped me with keeping my meals interesting. I used sooo many recipes from there. I’ll say, a lot of them tasted terrible (most likely from me not following the recipe) but it was a lot of fun! The biggest thing it helped me with was find healthy alternatives to the things I loved. Pasta was a huge part of my diet and I was able to find so many good recipes just through a simple search. If all else fails, I support you! Reach out to me on instagram or my contact page and I’d love to help you! I had a lot of love and support when going through this journey (and still do!) so it’s my time to give back and help you! Big physical changes don’t happen overnight. That’s what makes this as difficult as it is. It’s hard to stay motivated if you don’t see a big change. However, what helped me was taking progress photos periodically. You see yourself every day. You won't notice your physical changes unless you look back on old pictures of yourself. What also helped me was noticing the small changes because they will start adding up. I noticed I could move easier, my pants were a little looser, I was enjoying veggies more and more. These small changes will start adding up and soon you will be impressed with what you are capable of now! You just have to remain consistent and know it will pay off in the long run. Of course there is a lot more that goes into weight loss (i.e. making sure you’re in a caloric deficit, eating enough whole foods etc) but I wanted to touch more on the mental aspect of achieving your goals. The reason for that is everyone’s body is different. I’m not a nutritionist, I can’t prescribe a one size fits all diet. That doesn’t exist anyway. But what I can do is help you get your mind right. Once you have the mentality straight, everything else will follow. You may make mistakes, but you will also learn what works for you. So with that, I hope this blog helps you find the right headspace to achieve your dream body! I’ve said this 100 times and I will say it 100 more: it all starts with a mindset. This photo was taken before my weight loss. I remember feeling like a new era was coming and wanted to have my picture taken. In March of 2017 is when I officially decided to take responsibility for not only my health, but my life. I had been overweight almost my entire life and had attempted to lose weight before. These attempts mostly consisted of just restricting my calorie intake. Of course, this just lead me to being extremely hungry and end in binge eating. More often than not, I ended up gaining more weight than I started with. One of my more serious attempts led to me eating a strictly paleo diet. This worked well because I ate larger portions of meat and more veggies. The meat kept me satisfied for lengths of time so I wasn’t tempted to eat as much. I was able to lose about 30 lbs, however my mindset was not in the right place. I was too restrictive of myself and didn’t allow any treats which was not maintainable. The second I slipped up, I had this “to hell with it attitude” and binge ate again and abandoning the diet completely. Again, I ended up gaining it all back and then some. 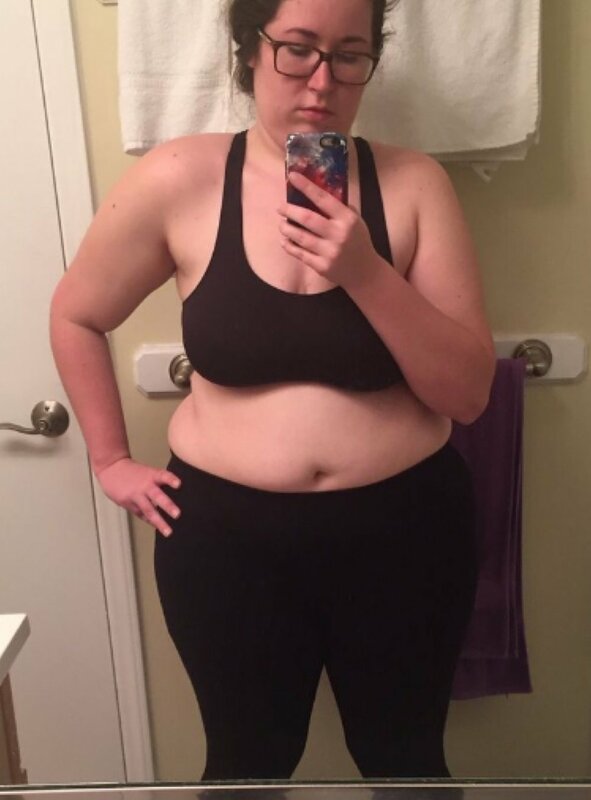 This time around I was determined for my weight loss to go differently. March of 2017 I felt different. I KNEW I was going to reach my goal, so I was in no rush to get there. I wanted to take my time and find a way of eating that I felt like I could eat the rest of my life. My current eating habits consisted eating a lot of hibachi, alfredo pasta, and ice cream. Not to mention, I had HUGE portion sizes. I would eat entire tubs of ice cream in one sitting after I just ate a whole box of pasta. If I had to estimate, my average daily caloric intake was around 3500 calories. I knew I had a long way to go so I figured if I made small changes here and there, overtime it would add up. Simple enough, right? This is my actual before photo, taken March 26th. I’ll admit, it was pretty simple once I had the right mindset. I first started by eating a healthy breakfast and allowing myself to eat whatever I wanted for lunch and dinner. After I got used to that, I would make a healthy lunch too. Before I knew it, I was eating a healthy breakfast, lunch, AND dinner. When looking back at where I started to where I made it to it seems like a monstrous task. However, when I broke it up into smaller and more manageable steps it was far easier than I thought. Throughout the beginning of my process, I allowed myself to eat as many fruits and veggies as I wanted. I wanted to teach myself to be satisfied off of health foods, not that I needed to be deprived. I will say when I got the hang of eating fruits and veggies in all of my meals, I did start to limit my calories. But throughout this whole process I was strategic about what I ate. I chose nutrient rich, low calorie foods (aka veggies) over things that were more calorically dense (such as pastas). By making these choices, I was able to satisfy my hunger. The comments I always seem to receive is that “Oh I could never do that, I hate vegetables!” Uh hello!!! Me too!! I told you what I used to eat! BUT, when you make these small changes over time, your taste buds will change too! Throughout this whole process if I really really wanted a treat, I’d allow myself to have it. But it’s important to learn the balance between treating yourself and having the determination to achieve your goals. It was trial and error for me. There were times I was super restrictive and other times I was treating myself too much. I really just had to learn that balance. So, as you may or may not know, I now eat a plant based diet. This was only a recent change though. Throughout the majority of my weight loss journey, I ate paleo based. When I started out, I had no idea I would end up eating plant based. Like I said before, I just wanted to make gradual changes that were easy to make and added up in the end. Switching to a paleo based diet wasn’t too drastic of a change for me to make. I wasn’t really a picky eater so eating veggies was a little easier for me than it is for others. Over time, I did grow to enjoy them more and more. This is what I look like currently. In June, my best friend encouraged me to do Whole 30 with her. Whole 30 is essentially the idea to eliminate common foods that people have intolerances to (gluten, dairy, sugar, etc.) for a full 30 days. After the 30 days are up, you can slowly reintroduce these foods back in to see what foods your body reacts negatively to (for more info go to whole30.com). I will say during this month I did see results. I lost a significant amount of weight. However, I would never do or recommend this type of eating ever again. It was so restrictive it started to restrict my mindset. I wasn’t eating enough calories. I had these periods of feeling really lightheaded and nauseous. I would be extremely thirsty. I once even fainted my blood sugar was so low. This mindset carried with me throughout the rest of the summer as well as the sickness. At the time, I didn’t understand what was going on. I went to the doctor and they said that everything looked normal to them. It wasn’t until months later I understood that it was my mindset that was really limiting and causing me to have issues. Around September was when I started to bring balance back into my life. I didn’t allow food to control me anymore. I was able to allow myself treats. Admittedly, I would eat too much occasionally, but I was able to forgive myself and continue eating how I should. I can attribute this to September being my birthday month. Regardless, I was able to enjoy myself while still keeping my mindset in check. Another after photo. I'm so much more confident and healthier now both mentally and physically. Over time, I began to eat more and more veggies as the bulk of my meal. By January, I rarely ever ate meat. In the 2018, I can count on one hand the number of times I ate animal products. To be honest, my tastes just changed. Before, meat had been a major part of my meals and sometimes the saving grace that allowed me to eat the veggies with it. Now, I didn’t look forward to eating meat so I stopped buying it and eventually just stopped eating it all together. I already didn’t eat dairy as I was eating predominantly paleo based. Switching to a plant based diet just made sense for me. After I did my research and learning about all the benefits, I knew it was the right thing for me to do especially since I was already eating that way regardless. One year later I was eating almost completely plant based and was 60 lbs down. If I look back to that March of 2017, I would have laughed if you told me I’d be where I am today. Losing weight is a monsterous task, specifically when you have a lot to lose. It would have been easy to get overwhelmed. However, I have found the key is taking small, maintainable steps. Don’t set out to start on X date and eat healthy from that point forward. That is extremely hard. Instead start right here, right now where you are. If you drink nothing but soda, start by limiting to maybe 2 a day. Soon you’ll get down to 1 a day, then 1 a week, 1 a month, then almost never! The same thing can be said with almost any habit. Start slow and take your time. The saying is true, slow and steady wins the race. I took 1 step every day for 365 days and I was able to come as far as to lose 60 lbs. I still have a way to go but I’ll make it there by taking one step at a time. Sign up with your email address to receive updates from me!